Essential application for managing your precious personal data on your mobile and desktop. 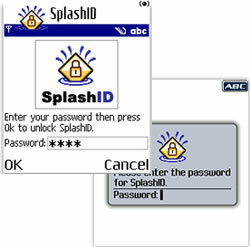 We positively overflowed with love for Splash ID when we reviewed the mobile password manager last year, and with both the mobile application and its desktop companion still enjoying daily use in the office, we were keen to give the latest version a once-over. 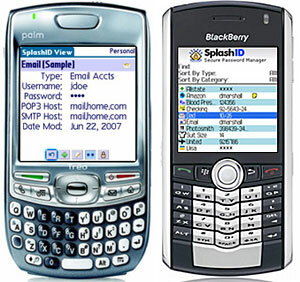 Now up to version 4, Splash ID is available for a host of mobile platforms including Pocket PC, Windows Mobile Smartphone, BlackBerry, Symbian UIQ (Sony Ericsson P800, P900, P910) and Series 60 (Nokia) and the Desktop Editionhappily runs on Windows and Mac platforms. 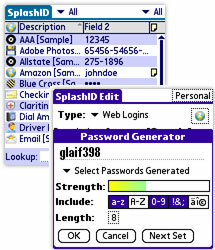 The program lets you input, organise and categorise a wealth of personal data like user names, passwords, credit cards, and PIN numbers into your mobile phone and desktop PC, and keep the whole lot safe from prying eyes behind a 256-bit Blowfish encrypted password. The latest update retains all of the useful features of earlier versions, but is boosted by an enhanced security option which automatically locks out wannabe hackers (or hopelessly drunken owners) after 10 failed attempts before erasing the entire database off the handheld. Designed to prevent Brute Force Password Cracking Techniques, legitimate users should be able to get all their data back once they've synched with their home machine and/or imported any backups they may have created. There's also a password strength meter to help users come up with something a little more secure than 'password' or '123? * and a password hint option to nudge failing memories. The desktop version comes with a Web Auto Fill feature that lets you log on to websites automatically with one click, which is handy if you're worried about keyloggers lurking on your machine. Sadly, this only appears to work with IE and not our preferred Firefox. It's also possible to synchronise multiple SplashID databases (with other v4 database files), set up additional standalone desktop users and share securely encrypted SplashID files to other users. Thanks to SplashID's cross-platform capabilities, your data is pretty much future proofed - even if you keep changing mobile phone OS's - and with the latest version priced at just $30, we think it's an invaluable security investment for mobile users.